I am loving the Moroccan vibes!! I have a project coming up and hope to be able to use several of them! I follow RDS on FB and pinterest! Such great inspiration! 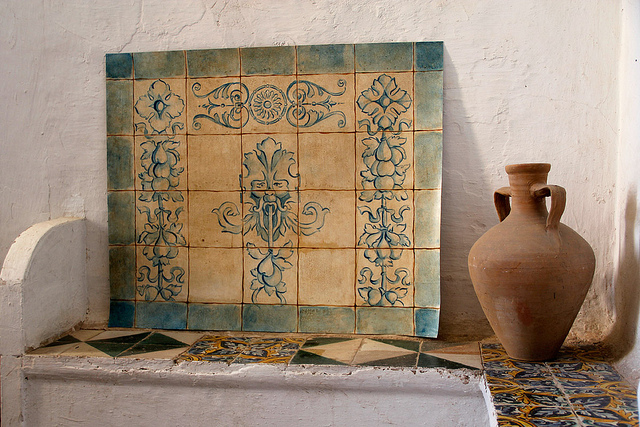 I love the Moroccan collection; the star diamond would be great on a patio table, and the endless circles for a dining room wall or the large Moorish Trellis stencil for the dining room or possibly my bedroom. There are so many great designs, I couldn't pick just one!!! Recover quickly!!! Healthy thoughts your way. I love the Moroccan Casablanca trellis. It reminds me of my childhood. Springtime in Paris Letter stencil for a while now. I would love to add it to a large antique mirror. I am also a follower on Pinterest. It's hard to choose just one, but I'd love to use the Kyoto stencil on the wall behind the bed and then also stencil it on a bed skirt and maybe cornice boards and a throw pillow or two to tie the whole room together. Thank you for this beautiful post but I am so sorry to hear that you are going back in for surgery. You will be in my thoughts. No need to enter me in the giveaway (even if it is lovely) as I am so thrilled with my Jose Esteves lamp for Interieurs! And I didn't know that you spent time in San Diego. My parents lived in Crown Point for over twenty years and I spent a lot of time with them there--I love it! And may the surgery go well, and I hope the recovery isn't too hard on you. Many many good wishes from your faraway friend. Best wishes for a successful surgery and speedy recovery. Thank you for introducing us to Royal Design Studio. I love so many of their stencils. The classical torch motif is my favorite. I hate to learn that you will have to have more surgery and rehab. You will be in my thoughts and prayers. This is such nice giveaway. 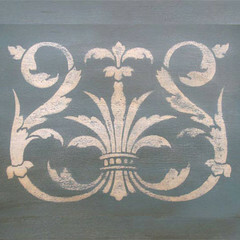 I love all of the damasks stencils. i would love to try the indian paisley! thanks for the chance! The ornamental cartouche is just the thing for my powder room! They were all so beautiful but now I'm more concerned about you! I hope the surgery is better than even hoped for and i will be praying for your recovery to be speedy! You are such a dear and your comment on my personal blog were so sweet today! I'm so glad we've gotten to know each other through this blogging adventure! I sure do love it! I'm also excited to find out about this new site and will look into it tomorrow! After I recover from market! Many prayers and thoughts are sent your way! Great giveaway, as always Karena! Best of luck with surgery and rehab. I know you'll be on your toes soon! Springtime in Paris for sure! Darling friend, COUNT ME IN!!! Karena! Best of luck for a quick recovery from your surgery! I hope all goes well and that you are back to your wonderful self soon. 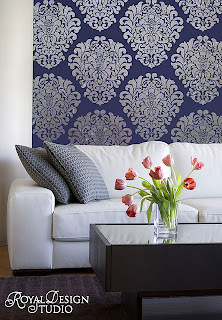 I love Royal Design, too and would use the Ikat Morrocan stencil for an accent piece and in small applications. 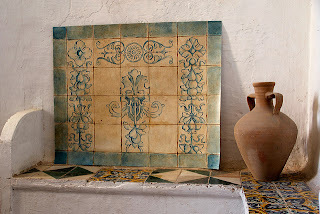 I want to do a tone on tone Morrocan stencil in my dining room. Thanks for the ideas and beautiful post. 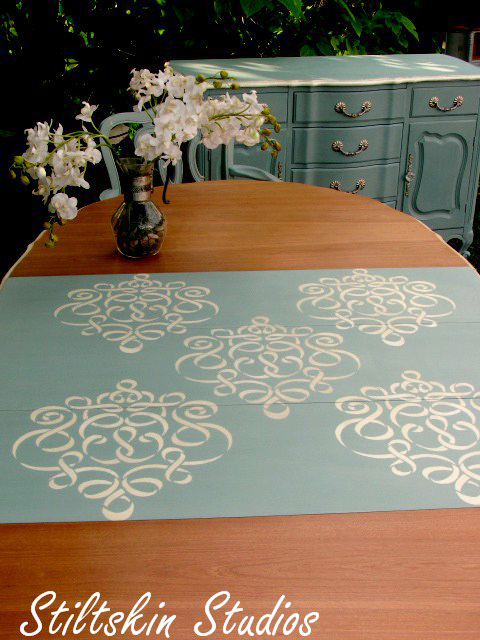 small scrollallover furniture stencil... it's hard to choose. best wishes for an easy and quick recovery! I wish you the best of luck with your upcoming surgery!! Thank you for hosting this giveaway. I'll put it on my Facebook page. I hope you will be feeling better soon! I love the Springtime in Paris stencil. I already like Royal Design on Facebook. I'm now following Designamour on Twitter. I'm now following the company page on Pinterest! Thanks for the opportunity to enter! My favorite stencil is the Grand Damask Element Wall Stencil. Thanks for the great giveaway. Karena, thank you so much for coming by to comment on my Wonder of Simplicity post at Quirky Vistas. I wish you all the best as you go through your surgery. Hopefully you will be up and dancing again before you know it. I'll have to come back after work to check out the site with the stencils and pick a favorite. Thanks for the heads up! The ided to paint just the table leaves is pure GENIUS!!! I love it! 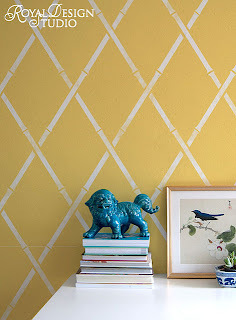 I really like the Acanthus Trellis Wall Stencil and the Chinois Leaves Wall Stencil. 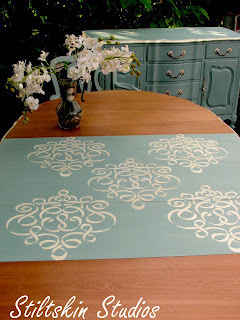 I know Royal Design has high quality stencils; they've been a favorite of mine for years! I hope everything goes well with your surgery! Let me know if there is anything I can do! These stencils are very nice. I love this border...Floral Embroidery Border Stencil. 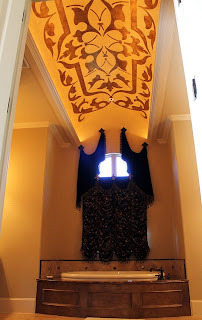 I'm getting ready to paint my bathroom and it would look nice above my tub! Thanks! What a wonderful giveaway. I really like the Small Acanthus Damask. Following Royal Design Studio on Pinterest also. WOW....is all I can say,this is some amazing work...loved so many of the things I saw...I will pop over for this great give away!! I love the Moroccan ones, too. Now come by and enter my giveaway! Looks fantastic Karena, a great learning experience. Obviously, count me out of the giveaway. You are always so generous with your giveaways! Also, praying everything goes smoothly for you and a speedy recovery. I would love the 3098 Contempo Trellis Wall Stencil for my boring bedroom! 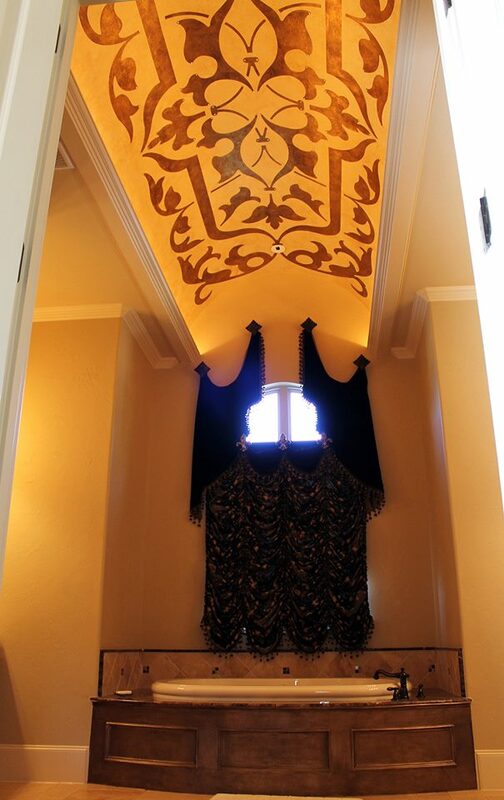 I would use the Camel Bone Weave on the ceiling in my guest bath!! I liked Royal Design Studio on facebook!! I follow Designamour on twitter!! It was great to chat with you yesterday, Karena....praying for a speedy recovery for you each day. I love the Classic stencils, but wow they are all amazing. I have a few walls I could use them on, but I think I would put them on fabric. Too many to choose from! You really have the best giveaways. Aww. I want to learn these kind of art. Its quite interesting and useful. I hope your surgery goes very well and the recovery is speedy! Karena, These are truly amazing stencils! I love the bee stensils. I just painted a small chest and would love to stencil the side of each of the drawers! Please enter me in this generous giveaway! Keeping my fingers crossed! Blessings to you, through this blasted hip surgery! Wishing you a speedy and full recovery! I hope you are up and dancing really soon!!! My friend was also young when she had hip surgery and it has given her a new lease on life!!! Great stencil company! I use them all the time!!! Karena, thank you for introducing me to these stencils . what a great way to customize a room. I love the moroccan wall stencil. Good luck with your hip surgery, I am sure you will be dancing in no time!! I started following royal design studio on Pinterest, great images! Love Paris in Springtime Stencil! 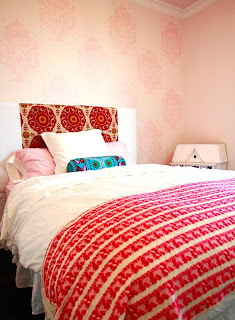 Loving some of those graphic moroccan stencils. I think I want to do one in one of my bathrooms....would be fun! Sure you will be back in blog business asap! Karina I wish you well with your recovery... Think positive and you'll be back on your toes in no-time! 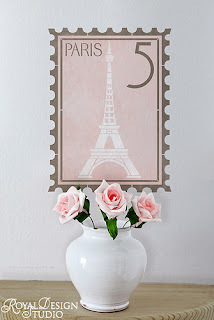 I love the Paris In Springtime Letter stencil...and many more! Thank you for popping in to visit me today...and inviting me over to this wonderful give a way! My goodness! Another surgery. You will be in my thoughts and prayers, dear Karena! You are HOME! My dear, I wish you the best in recuperation and strength! HOW LOVELY OF YOU to come and visit me! Are you feeling strong?I hope so! May each day bring you closer to achieving your goals my dear! OH, go to my Etsy shop when you get a chance and see my new wand! These are truly amazing stencils! I love the bee stensils. I just painted a small chest and would love to stencil the side of each of the drawers! Interior design includes many types of different products which can attract to anyone. This above interior design is looking awesome.